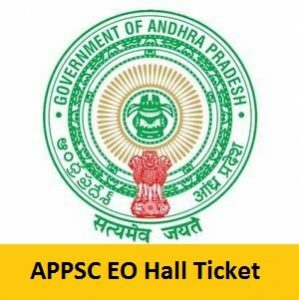 APPSC Extension Officer Hall Ticket 2019 Will Be Available From 24th April 2019: Good News for the aspirants who applied for the APPSC Extension Officer post. The Officials of the Andhra Pradesh Public Service Commission released the examination date for the APPSC EO post. The APPSC EO Exam Date is 29th April 2019. Candidates who completed their registration process will get the APPSC Extension Officer Admit Card 2019. You can also visit the Official Website of the APPSC i.e., psc.ap.gov.in to get your admit card. This page provides you with the complete details regarding the APPSC Extension Officer Examination 2019. Before attending the examination center, candidates need to carry their valid admit cards. You can download the admit cards from the official website. Without the admit cards, candidates are not allowed to attend the exam. So, download the admit card and refer the exam pattern before attending the exam. The below sections of this page provides you with the exact details about the exam like selection process, mandatory documents, steps to download the admit card. Aspirants can note the details which will be appeared on the psc.ap.gov.in Hall Ticket 2019. The hall ticket contains the personal information of the candidate appearing for the exam, examination center, Examination timing, and some important details. The venue of the Examination. First, enter into the Andhra Pradesh Public Service Commission official website i.e., psc.ap.gov.in. On the home page, you will find the flashing links related to different posts. Search for the required admit card link. After, finding the link, click on that link. You will get a submission form to be filled. Fill in the details carefully and then submit it. Then, the APPSC Extension Officer Hall Ticket 2019 will be generated. Take a certain number of hard copies of the admit card which is very important for the examination. This is a good opportunity for the aspirants who are preparing for government jobs. Hope that the information given above is useful. You can find the syllabus for the APPSC EO post. For any further information, you can contact us at freshersnow.com.